Some are saying that 2019 will be the year of the foldable smartphone and that the trend established this year will last for a decade or so. Only yesterday we saw another take on the foldable format from Lenovo-owned Motorola, seeking to rekindle its RAZR brand for the sleekest foldable we have seen so far, albeit only in patent drawing form. Previously Samsung showed off only the briefest glimpse of its foldable (recently teased for MWC), and Royole gained first-mover headlines with its rather inelegant FlexPai. Chinese smart devices and technology firm Xiaomi has been gaining traction in the west recently with improved distribution and presence here in the UK, for example. It is sometimes highlighted for offering a tempting mix of specs and value – growing the brand in a position that undercuts the flagship devices from likes of Samsung and Apple. Now we have seen the first foldable design from Xiaomi, thanks to a Tweeted teaser video featuring the company president. In the video, embedded above, you can see Xiaomi president and co-founder Bin Lin giving an unnamed #foldingSmartphone a test drive. The video starts by showing the smartphone screen fully opened, like a small tablet. As a rough guess I would say the opened-up size of the screen is about 6x4-inches, that's a 7.2-inch diagonal. It is possible to see that the phone isn't absolutely flat in this mode in the video demo. 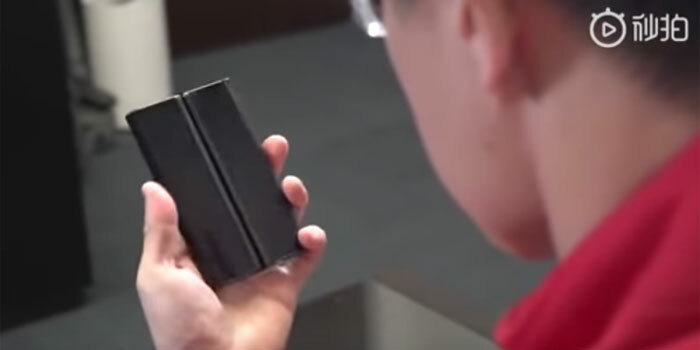 About half way through the video Mr Lin decides to fold the device up into a more compact mode, and it adapts to look like an 'edge' screen device from the front. The proportions look somewhat like the boxy original Samsung Galaxy Note, sans bezels. In the original Weibo post, Mr Lin asks his followers for feedback regarding the demonstration. The challenges of "flexible folding screen technology, four-wheel drive folding shaft technology, flexible cover technology, and MIUI adaptation," were overcome to build this prototype, he explained. Lin added that "If you like it, we will consider making a mass production machine in the future". You know, it's cool, actually practical (surprising for a modern tech development), but somehow I just don't care. This is a folding design I can get behind! The only issue I spotted though is that it doesn't seem very sturdy in it's unfolded state. If you look closer there is a clear curve there and he appears to be holding it very carefully, it looks like he is almost propping it up with his hands to keep it unfolded. Got to wonder what it was recorded with. I doubt it's much of an official marketing tool, but recording the co-founder and then uploading in 360p doesn't exactly ooze class or help hype. It's not like they're trying to be deliberately obscure. Even Xiaomi's cheapest phones record in at least 1080p as far as I'm aware. Mine does 4K@30fps, and it's just a Mi A1. Hopefully just an early prototype, proof-of-concept sort of thing… to be made proper sturdy later on?